Advantages: Good coverage of USAFE Phantom Units based in Germany. 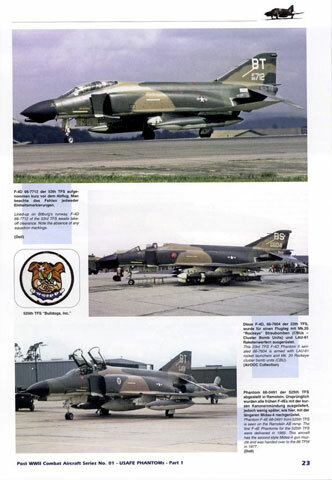 In parallel with their excellent Luftwaffe Unit History series, AirDOC of Germany also produces series on modern combat aircraft, particularly those with a strong connection to Germany such as the Phantom and UK Lightning. 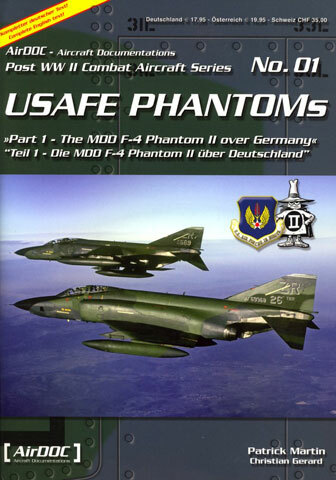 This volume on USAFE Phantoms dates from 2005 and is number 1 in the series. AirDOCs books are very professionally put together, being printed on high gloss paper with clear, largely colour illustrations. In addition to the generous photographic coverage are nice side profiles of representative aircraft of immense use to the modeller. Like other AirDOC publications the main text is in German, however it is alternatively printed with an English translation in opposite columns. The authors of this volume follow what is probably the best and most logical approach, which is to address the use of the Phantom in USAFE unit by unit. Units covered include the 26th TRW from Zweibrucken, the 36th TFW from Bitburg, the 49th TFW from Hollomon (yes New Mexico but a unit designated to reinforce USAFE in time of war), the 50th TFW from Hahn, the 52nd TFW from Spangdahlem and finally the 86th TFW from Ramstein. 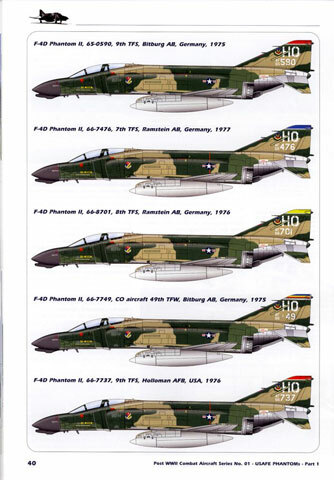 Given the range of units and the time span this means beautiful (can you say that about F-4s) Phantoms from F-4Cs to F-4Gs (RF-4Cs to F-4Es along the way) in camouflage from the SEA scheme through Euro 1 to Hill Greys. The succinct unit histories are equally interesting, not just covering USAFE operations but in some cases also that of USAFE units such as the 26th TRW in Operation Desert Storm. Overall this is very nice package and I look forward to reading Part 2. Modellers and historians alike will find it an extremely useful addition to the library.